OPPO Philippines recently launched the mid-range smartphone OPPO F3 with its unique dual-selfie camera feature, sleek body and attractive package. In the latest GFK Philippines May 2017 report, it shows that OPPO F3 emerges as the No.1 smartphone for the price band of Php15,000 to Php20,000 smartphones, with a dominating 48.5% market share. OPPO F3 started well in the market with 22,000 unit sales in the first three days of availability last May 2017. This reflected its strong acceptance from consumers because of the unique dual-selfie camera setup. The groufie camera enables an extraordinary experience in capturing amazing selfies with more range at any situation. Plus, the metal body and sleek body gives customers the luxurious feel appropriate for its price, along with ample 4GB RAM for multitasking and 64GB storage for all files needed. Additionally, OPPO also retains its No.2 smartphone brand position in the Philippines. A sign that the Philippine market well accepts the wide range of lifestyle-centric lineup of the brand. 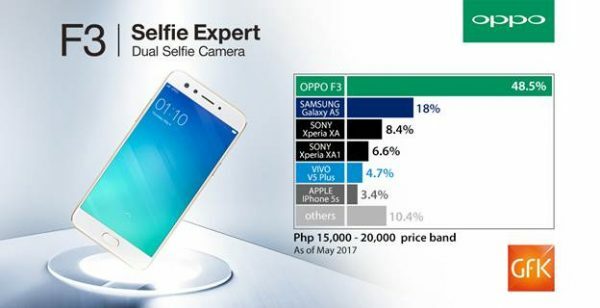 “The OPPO F3 is a well-received smartphone since the beginning, our competitive package, sleek design and trending dual selfie camera setup are the reasons why it is successful.” said Stephen Cheng, OPPO Philippines Brand Marketing Manager. Last June 16, OPPO released the F3 Black edition for more color options to choose from. Customers may now select from three colors available which are Gold, Rose Gold and Black for a more lifestyle-centric smartphone experience. The OPPO F3 is available nationwide in any OPPO concept and dealers stores for a special discounted price of Php15,990, under the Back-to-School Promo until July 31, 2017. All unit comes with a pre-installed screen protector and soft-transparent case for added value and protection. For more details about the OPPO F3, please visit www.facebook.com/OPPOPH or log on to www.oppo.com/ph/index.html.